My darling husband, Richard, has a fancy graphing calculator. 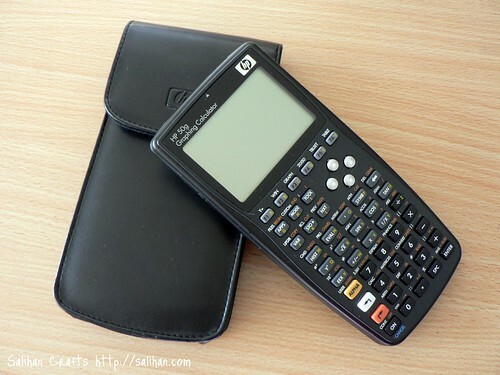 It’s much larger and heavier than a regular scientific calculator. It came with a thick and bulky leather case which he did not like very much. So Richard went through our sock drawer and pulled out a sock. It just happened to be one of the old socks we got on a flight to Singapore. I think it’s the blue that drew him to it. 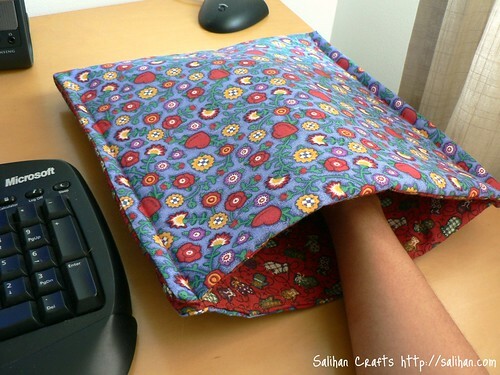 He thought it would be just right to replace the chunky calculator case. 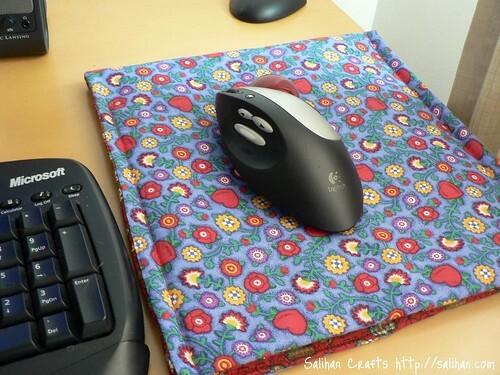 One day as I was looking for stationery on his desk, I saw his sock-covered calculator. 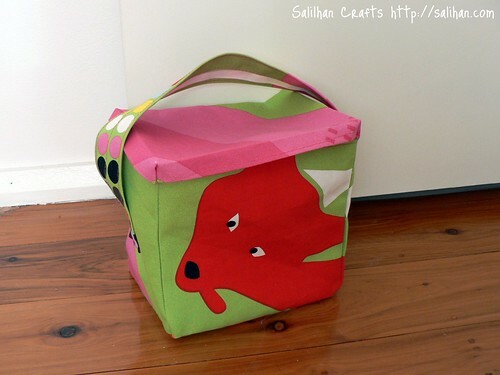 As a crafty person, this just won’t do! 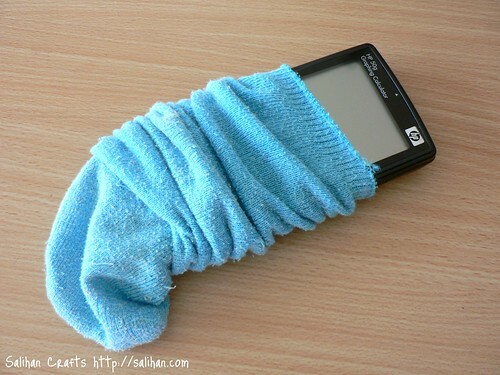 I cannot imagine my husband pulling this calculator out at a meeting and slipping the sock off onto the desk! What was he thinking? So with my newly acquired felt making skills, I handmade him a custom sheet of felt in two shades of blue. 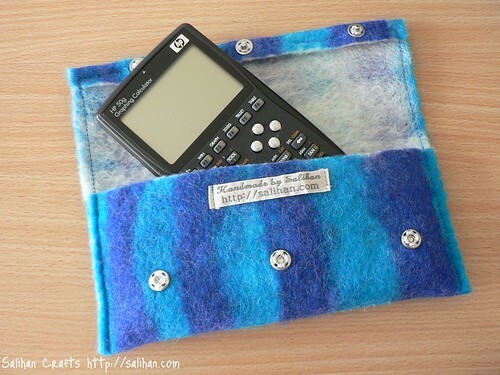 He liked it and gave me a design brief for his new calculator cozy. 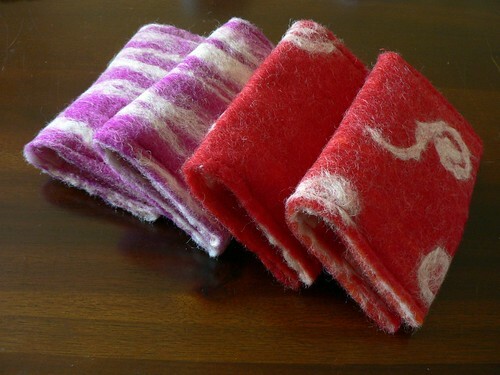 The main priority is that the cozy must by slim, light and easy to use. 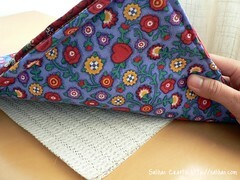 He liked the snap fasteners on the Aunt Flo’s purses and wanted the same closing on his cozy. He is a perfect client! He knows what he wants and he is open to ideas. Gotta love that. Well, Richard has been nagging at me to rest now. I’ve had a cold for over a week and I’m not that much better. “I have not seen you rest since you’ve fallen sick! GO TO BED!” he says endlessly. I’m a terrible patient. I can’t stand not doing things. But I must rest. So I’m going back to bed and I hope all of you are in the pink of health! Take care and have a good week! I might see you soon. Door stops come in so many shapes and sizes. 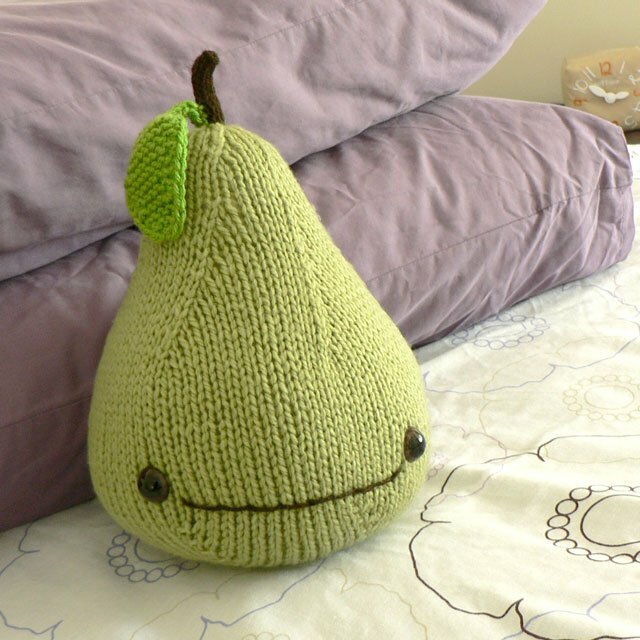 But handmade ones seem to have a pretty standard look. I do like the look and shape of these sand or rice filled door stops. I think the handle is handy dandy and I can pick fabrics that would suit the room it’s in. It’s rather easy to make and the tutorials are easy to follow. But the problem for me is that these door stops are not washable. I can imagine that they’ll look pretty grubby after a while. I’m too much of a clean freak to want that. Then I found this clever door stop by Cooplet. This door stop has a tub filled with gravel inside. 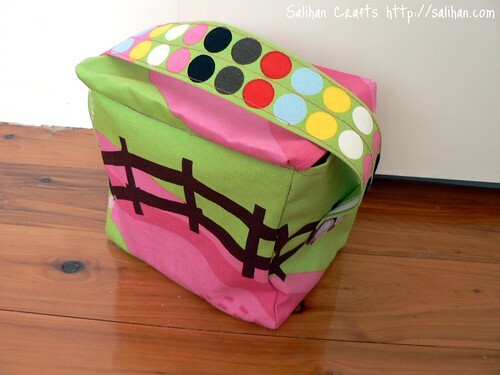 The sewn fabric disguises it very cleverly. But I don’t have a round tub or container like she does. Plus, it doesn’t have a handle. 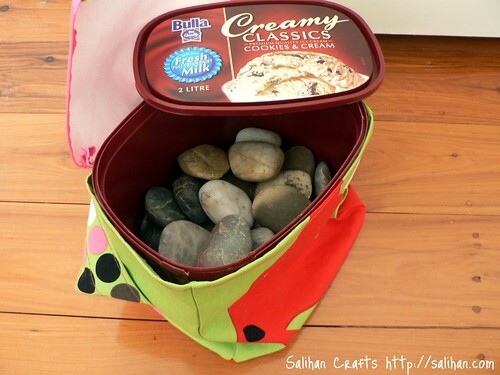 Inside the door stop is a recycled ice cream tub filled with garden pebbles. Heavy enough to hold the door open on the windiest days. 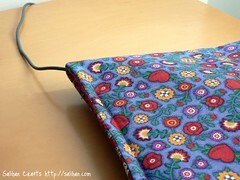 The fabric cover slips off easily for washing too. Have a foxy weekend everyone! Problem 1: You need to carry your feminine hygiene essentials to the toilet but you don’t want to take your bag with you. This is especially ackward when working at an office, in school or when you don’t have pockets to slip the sanitary napkin/ tampon/ pantyliner into. 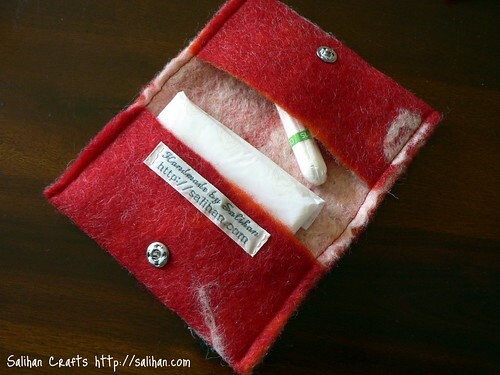 Problem 2: Your colleauge or friend gets her period but she doesn’t have any supplies with her. You want to give her yours but there are too many people around. A tad embarrasing for her and you don’t want to be sneaking around like you’re her drug dealer! Solution: Store your essentials in Aunt Flo’s Purse! 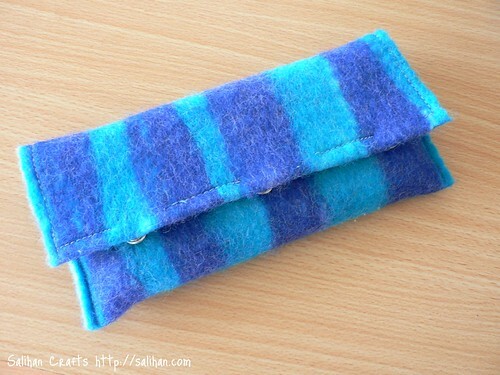 It looks like a little make-up bag or tissue holder. You can now carry your feminine hygiene supplies inconspicously because no one else needs to know that you’ve got your period. 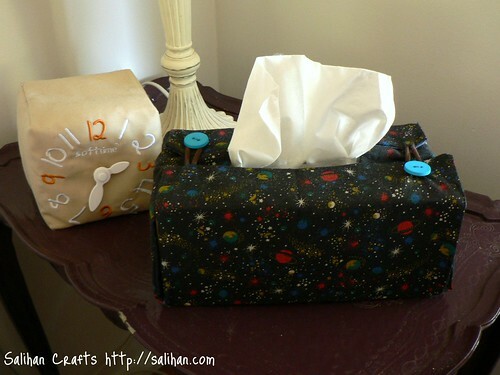 Last week I saw this wicked tutorial on how to sew a custom-fit tissue box cover (via Whip Up). Coincidentally, I’ve had that on my to-do list for the last few weeks. 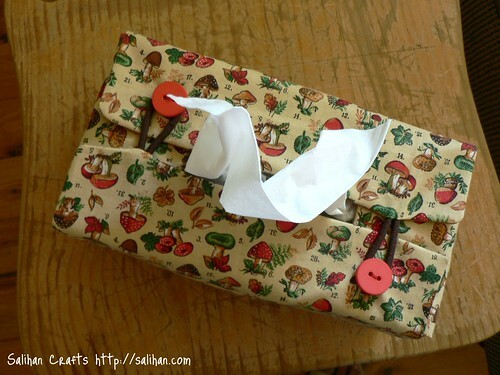 With autumn upon us now, our allergies are running wild and we scurry for the tissue box more often than we both like. 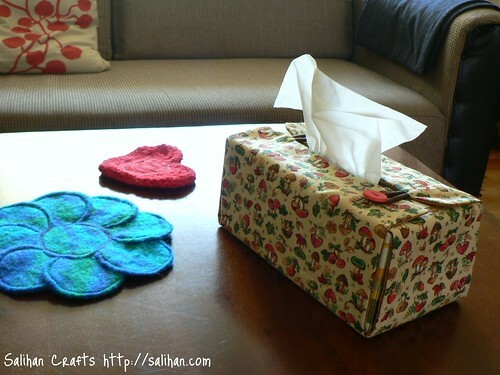 I have sewn two tissue box covers so far – one for the living room and the other for the bedroom. The mushroom design is so cute and the colours really complement the rest of the room’s decor. I just adore these buttons, don’t you? So bright and cheerful! 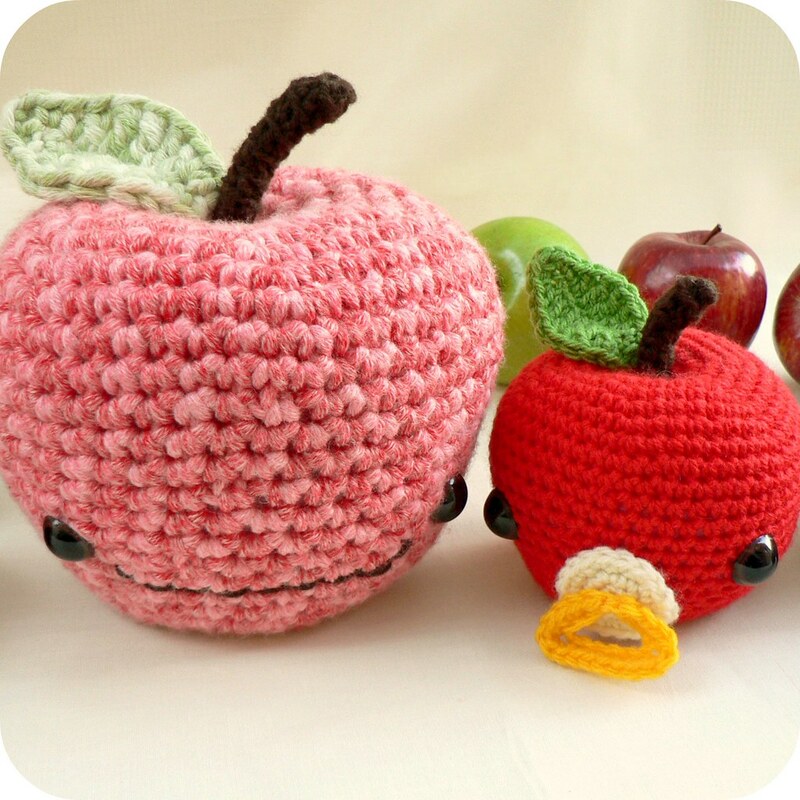 I bought them and many more from Etsy’s Buzzy Bee Shop. HUGE range of craft supplies. In case you were wondering, the elastic cords were just regular hair ties cut in half. I wish I can say that sewing these were a breeze. I guess if you can measure and cut accurately, you’ll be just fine. As for me, I stuffed up both times! I just can’t cut properly. It’s either crooked, or too small or big. I bought a cutting mat, quilting ruler and rotary cutter to help me cut better but I still stuff up! HELP! If you know of any online tutorials or good books that has helped you become an ace measurer-cutterer, please, please send me the links or book title. So my unoriginal tip for the day is to measure twice and cut once!